My first foray into the Russian River sour portfolio. Yeah, yeah, I know, how could I have never had a Russian River sour before? Because they're damn expensive, that's why. I am definitely aware of their reputation as sour makers, though (notwithstanding their obvious IPA skills), because it's pretty much impossible not to be if you're a craft beer drinker. 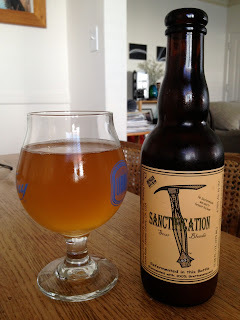 I also absolutely love their naming conventions for their Belgians and sours, all the biblical "-ation"s...well, biblical aside from Defenestration, which just means chucking some poor SOB out of a window. Oh wait, Wikipedia says that Jezebel was defenestrated. So that's biblical too then. The nose is tart without being full-blown acid overload, plus a good amount of fruit- peaches, I'd say, and maybe some orange/tangerines. Maybe even a bit of strawberry. There's very little brettiness (though it picks up as the beer warms), and it comes off amazingly clean. Flavorwise, yeah, it's pretty damn clean. There's more brett and more acidity in there than the nose led me to believe, welcome on both counts. But the brett is still pretty muted, likely because it's a 100% brett fermentation (counterintuitive, I know- read this nice little blog post from Modern Times for some info on that), and adds the perfect level of funk. There's fruit there, but instead of the peach/tangerine thing I smelled, it's like munching on a Granny Smith, minus most of that 'green' flavor. It's incredibly dry, and combining that with the acidity, there's pretty much nothing left on the palate a couple of minutes after a sip...that is, until you burp, of course, which you will because the carb level's pretty high. I had no doubt that this was going to be tasty, and it met all my expectations. Just a delicious, clean, easy-drinkin' sour. Just kind of a bummer that it requires going to the brewery to get it, along with pretty much every other sour Russian River makes.